An evening exhibit unveiling is scheduled for Friday, May 20, from 5 p.m. to 6 p.m. with free admission. The Visitor Center’s doors will close at 5:15 p.m. A brief program introducing the exhibit will start promptly after. The photographs, taken during the Great Depression, capture the early recreational use and development of Washington’s state park system. Many photographs show state parks under construction by crews from federal work relief programs such as the Civilian Conservation Corps (CCC) and the Works Progress Administration (WPA). The exhibit features some of Washington’s most cherished state parks, in addition to local state parks in the upper Cowlitz area, including Lewis and Clark, Millersylvania and the Jackson House Heritage Site. Asahel Curtis (1874-1941) was among the most prominent photographers of the Pacific Northwest. He spent more than 40 years documenting the rapid transformation of Washington State that occurred during his lifetime. His photographs provide one of the most complete historic records of this period. The photographs featured in the exhibit are from a unique type of media called lantern slides. 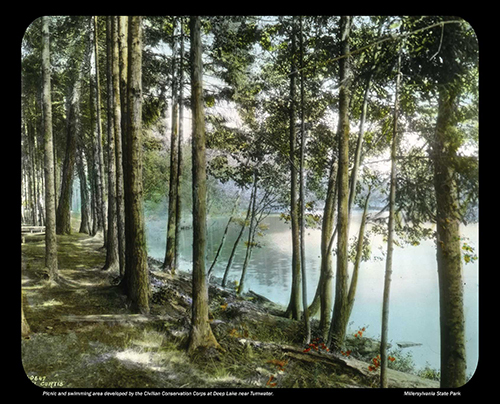 Originally black and white photos, they were color-tinted by hand in Curtis’s Seattle studio. The slides were recently digitized and are in the care of the State Park’s Collections Program. The exhibit was funded by revenues from the Washington State Parks specialty license plate, which are used exclusively towards state park education programs. The Visitor Center is open daily from 9 a.m. to 5 p.m. Admission is $2.50 for ages 7 to 17; $5 for ages 18 and older; $15 for families (two adults plus accompanying children) and free for children age 6 or younger. For more information about the exhibit, contact Alysa Adams, Parks Interpretive Specialist, (360) 274-0962 or alysa.adams@parks.wa.gov.